Cruise the Bermuda Triangle aboard a glass bottomed boat. Under starry skies your narrator will tell you about the infamous "Triangle”, while your boat slips silently into the depths and complete darkness. Enjoy the sudden illumination as the flood-lit ocean floor reveals the true treasures of the deep— beautiful marine life, corals, and even a shipwreck. Learn about the Bermuda "Night Life" while your crew explains the mysterious civilizations below. • Bermuda Triangle: Hear the stories of ships long lost, in the notorious depths of mystery and the unknown. 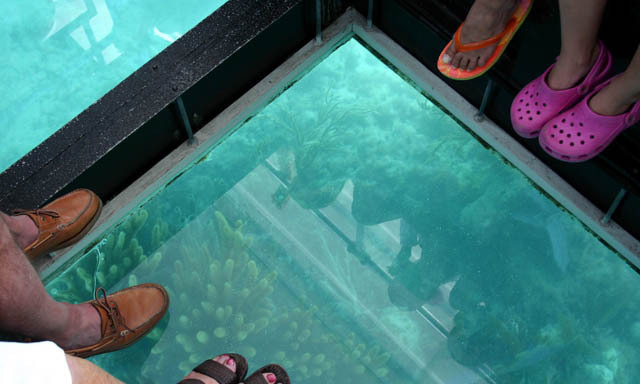 • Glass Bottom Boat: Watch as the ocean comes alive with illuminated, glorious ocean life and colorful reefs below. • Complimentary Drink: Enjoy a complimentary rum swizzle and full cash bar. • Guests must be 18 years old with ID to consume alcohol.